It has been a long wait, the weather in Pontypridd as we waited for the doors to be opened could not have been more of a contrast. Tonight, for the re-scheduled show the weather was sunshine, blues skies and warm, whilst back in March the ‘Beast From The East’ had its fearsome grip and the bands could not make it to town. Three bands set foot in town to make this a Friday we rock out in delight. Before the headline act Stone Broken with their latest album Ain’t Always Easy to showcase tonight there are two other acts to hear play live The Bad Flowers who should have played here last time and new act on the bill The Nectars. The first band of the night all the way from New Jersey bought a bucket load of music attitude to the stage. This young band with their debut album Sci-Fi Television out 25th May have an enticing rawness as they deliver their set. Jessica’s vocals cut through the guitar and deep rhythms; this is a performer with a sassy approach that gets you listening and watching her every move. The sound was raw full of alt-rock vibe that added layers of grunge with modernity. Whilst at the same time they were reminiscent of early Debbie Harry, with a touch of Ramones, Nirvana and The Dammed. The influences were there but the music was uniquely sweetened with The Nectars versatility and talent. The sound is youthful, angry with an anarchic protest vibe and sound. Yes, we will do our own thing and take pleasure from producing music that is ours. On stage, they interact building the atmosphere as they sing and play fast and loud with timing that was sharp and just got better as the set progressed. Highlights of the refreshingly different set were Cemetery Girl, We Will Run and Don’t Panic, this was the track they really went for opened up and showed the real power and shape of The Nectars with a sting in their tail. East coast attitude and music that has percolated through New York’s Underground scene works, then I thought they also remind me of a Well-hung Heart who Bluesdoodles reviewed a few years back. Definitely, a band to look out for at Festivals and venues as the tour in the UK continues. Short break and the band we are all talking about The Bad Flowers took to the stage. Delighted as Tom said to have not been defeated by the ‘Beast From the East’ this time and they now have a longer set which has to be good! The starting gun was set, bang The Bad Flowers were off to a flying start with Lions Blood. They hit the ground running fully of rocking energy harnessed and controlled through the vocals and Tom Leighton’s guitar, Dale Tonks’, rumbling bass and the antics of stick manipulator extraordinaire Karl Selicks. Throughout the powerhouse of a set ,this is a band improving with every performance and note they play it is Tom’s warm honeyed muscular vocals that hit you they are awesome. This is a trio making a sound that never disappoints will leave many looking around for other musicians or electronic trickery as the sound is huge with deep melodies and dramatic lyrics. The Bad Flowers aisa real rocking masterpiece of three musicians in perfect harmony playing authentic rock they believe in. Every song has a moment that makes it stand out in your memory, Dale’s bass-line of Devil’s Breath; Karl’s drumming on a favourite of mine Rich Man what a great song with the lyrics driving over the drums not with a shout but the melodic roar from Tom. This is a band that just send out huge musical vibes from the stage. As they play tracks from the debut album, we want to hear these and are excited about what is coming next as new material gets weaved into the set list. 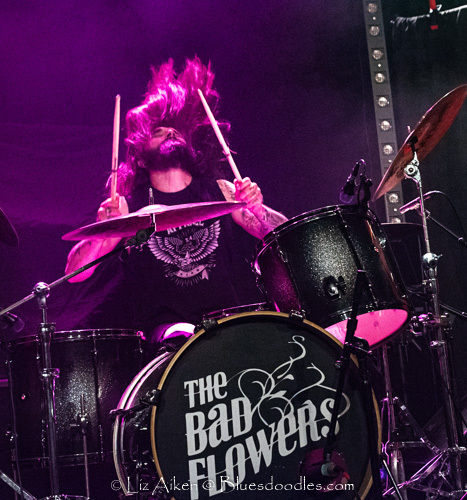 The three Bad Flowers are a tight unit, they all have a telepathic sense of each other’s every move and nuance as they play the music hard and live. As they closed out the set with Thunder Child and City Lights, the number that is the signature sound of the album. Band Flowers tonight you stormed Pontypridd without having to play Hurricane! The crowd was loud, enthused and delighted we want you back to the Muni soon!! Many will be joining you with high anticipation when you play Wales again up the mountain at Steelhouse Festival this July. Now, for the headliners who have a deep and loyal fan base that keeps growing. The Broken Army is determined to ensure the band continues their seemingly meteoric rise to the notice of radio, festivals and promoters. With a second album under their belt, Ain’t Always Easy and debut on Spinefarm Records this is a tour celebrating the music they love to play with high levels of energy and interaction between the four who are not Stones or Broken but together they are Stone Broken. They hit the stage to a barrage of cheers that roared out of The Muni and across the hills that surround Pontypridd. The entrance was fitting of an arena event as, bright flashing cascade of lights lit the stage and auditorium which put the crowd in the mood for some rocking pyrotechnics. The band for many need no introduction, but they are relatively new and people are still finding and exploring their music. They are the dramatic rhythm section of Robyn Haycock on drums, with her irrepressibly wide grin and flashes of red hair and the bass that growls and adds some control to the sound from Keiron Conroy. Joining them are Chris Davis on Guitar and front man vocalist Rich Moss with his Eclipse ESP guitar tonight. Each side of Rich are two risers for the three of them to use gaining height and using this to dominate the crowd. Tonight the smiles were bright and the confidence of the band exuded into the audience who knew this was going to be a performance that was anything but broken. Tonight may have been a detour, which perfectly sums up touring It Ain’t Always Easy, they had arrived in Pontypridd and opened the set with Heartbeat Away. For many tonight was the first opportunity to hear the album many had on repeat since its release on 2nd March. The opening number deals with a serious subject, live it is full of verve as the combination of the two guitars are joined to perform with riffs and rock that certainly makes a venue hum with pleasurable delight. Then they take us back to the debut album with Better, there was no hard sell tonight it was all about playing music that they want us to hear with charismatic style. The lyrics sung with emotion that the live set always captures we were now marching in accord with the Stone Broken Army of fans and followers of every note played and lyric sung by Rich. We are not wishing our lives way we want time to stop and live music to play on and on with no interruptions with an array of bands and the three that performed tonight would be in the mix by the crowd’s supportive and genuine applause. Now back to the act in question, Stone Broken. They stayed with Stay All Night and the distinctive SSB opening riff cascaded once more across The Muni with an interlude of Stay All Night. Back to the current album, played not in the album order this trio of sounds added an epic sound to the set with, I Believe, Follow Me and Doesn’t Matter. If you ask the fans who were jumping in delight smiles bigger that those of the band, they love these titles that encapsulate their very thoughts. It doesn’t matter what people say we love ‘em, the Broken Army will follow them as they Believe that the sound is wonderful and the star shines bright for Stone Broken and they want to share the road with the band that warms their musical heart and soul. The set played on the music flowed the venue was awash in the licks, riffs and chords of the band, Robyn, had her moment up front with the boys with a dexterous drum solo that had the crowds whooping and stamping their feet in time. The energy was hot tonight as the drums went back into the mix of sounds with Worth Fighting For ending the main set. We hadn’t heard Rich on acoustic. Would this be the encore. A short but noisy wait thanks to the crowd and the question was answered. Yes, opening the trio of songs was Wait For You. We had a ballad with the crowd singing in good voice the valleys rang out to Stone Broken’s melodies. The night closed with Not Your Enemy and what a night of live music three bands, three sounds and an audience once again ecstatic that The Muni is once again alive with the sound of music being played. Did Stone Broken deliver? yes ,they did. The glam and glitz catches the eye, the connection between they are a Nickelback clones still rumbles on. Does it do them any harm – not for now. They have our attention they need to stamp their collective feet in unison and demonstrate that these are a headline act that we will be on the phones for tickets the moment their arena tour is announced. They have the energy, they have the talent now harness it and make sure authentic West Midland Stone Broken rock is what shines through whatever the tempo and tone of the tracks being played.